Click on the picture to find out more and/or book your accomodations. This newly remodeled and updated cabin has comfort and convenience. Located near a private boat ramp that serves as a common put in/take out point for float trips, Mickey's is conveniently located in a quiet and remote section of the Creelsboro community, about 8 miles below Wolf Creek Dam. With "everything but the eats and drinks", Mickey's comfortably sleeps 4 anglers and has a wide range of amenities, including satellite TV, a propane grill, a fully equipped kitchen, linens, towels, and even some good reading material for the front porch. Mention that you are fishing with Hagan for a discounted rate. 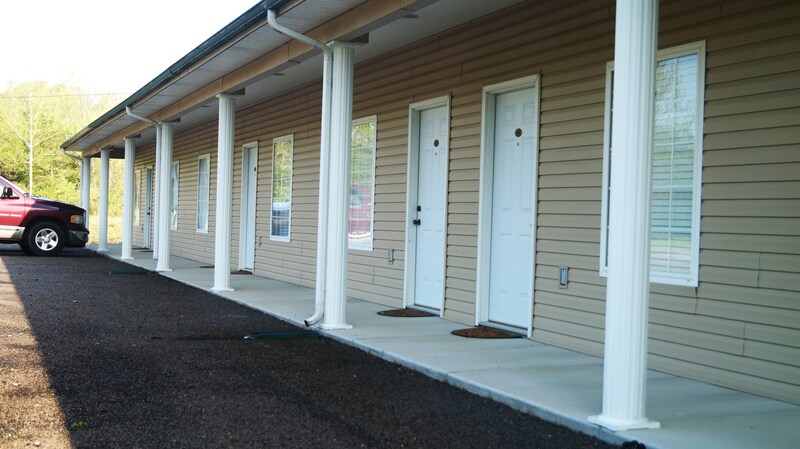 The nearby Lake Cumberland State Park offers a variety of accomodations. Lure Lodge has many nice rooms close to Lake Cumberland and State Dock Marina. There are also cabins available to rent within the state park. Lure Lodge has a nice restaraunt that is a good dining option for those staying at the park. Close to the dam and the Ray Mann Road river access, the Riverside Inn is also close to good Hatchery Creek fishing. Rocky and Tonya Menix (270-343-3344) are wonderful hosts and also have a very nice and comfortable cabin nearby available for rent at 204 Riverview Drive. These are nice places. For now you will need to call to make reservations at Riverside. Mention that you are fishing with Hagan for a discounted rate at the motel or cottage.